A Girl and Her eBooks: The Essential Guide to Baby Sleep by Sarah Jefferson - FREEBIE! The Essential Guide to Baby Sleep by Sarah Jefferson - FREEBIE! Does your baby have trouble falling and staying asleep? Are you confused and overwhelmed by the mountain of information on how to get a baby to sleep? Would you like to find a method that works for you - sleep training, co-sleeping or something else? The Essential Guide to Baby Sleep can help you quickly find ways to get your baby to sleep so you are no longer sleep-deprived and cranky, and you can finally enjoy parenthood to its fullest. - Get your baby to sleep quickly. - Compare the major sleep methods, including sleep training and co-sleeping. - Find a proven method that will improve your baby's sleep. - Discover techniques that will help your baby sleep through the night. - Implement a routine that will benefit your baby in the long term. 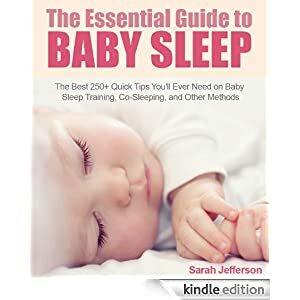 Based on Sarah's own experiences and her obsessive research into the topic, The Essential Guide to Baby Sleep summarizes the main sleep theories, including co-sleeping and sleep training, and also offers an alternative. Its philosophy is based on the idea that every baby and every parent is different, so what works for one family may be useless to another. In this baby sleep book you will discover many new ideas to get your baby to sleep better. Its easy-to-read tip format will quickly direct you to the sleep methods and techniques that will work for your family. When you start following these simple tips you should see immediate improvements in your daily life. Over time, the sleep techniques and routines offered in this book will help your baby develop healthy sleep habits, not only now but into childhood and beyond. P.S. This book comes with FREE bonuses, so pick up a copy now for yourself or give it away as a gift to new parents!